Our reseller in the Detroit area Maxi Container told us recently they discovered a new application for the RainSaucer- leaky roof catchment. This is apparently a big problem in older warehouses where the roof is need of repair. Buckets are no good in such situations because the water dripping from on high covers a wide area. Drain tarps are the traditional solution but hanging them up can be a hassle if the roof is really high up. 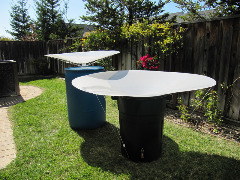 Maxi told us they tried the RainSaucer and it not only worked great but it was a quick way to respond to sudden rain storms. In fact, Maxi was so enthusuastic about the discovery they got other warehouses to purchase the product for the same application.